Abstract: The DVD/CDROM lies hidden behind the front control panel, and with the push of a button that easily folds down so that disc's can be changed. 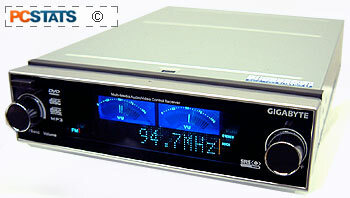 It looks like a car stereo and performs some of the same functions, but is far from that. The M1600A from Gigabyte is both DVD player and audio console combined, and what's more, it will run with the rest of the PC turned off. Dial in your favourite FM radio station while slugging it through a long word document, or after a hard day when the last thing you want to do hear is noisy cooling fans. The M1600A plays CD's and MP3 CD's, with or without the computer powered up, and features FM radio presets and a very cool electoluminescent/VFD sound level display up front. Because the M1600A fits into a standard 5.25" drive bay and requires no case modifications of any type, it is not much more complicated to install than a regular CDROM. The DVD/CDROM lies hidden behind the front control panel, and with the push of a button that easily folds down so that disc's can be changed. A control card and AC/adaptor are part of the reason why the M1600A can operate autonomous from the rest of the PC. 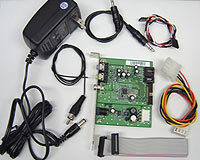 The control card provides the power backup, FM radio antenna connection, and in/out audio jacks for the M1600A. Jumper cables rout the audio out to an adjacent sound card, making the M1600A refreshingly good at coexisting with current sound cards components. AC adaptor, audio cables, antenna, power adaptor, control card, data cable., instructions. The DVD/CDROM drive sits behind the front control panel which offers a visually appealing display that seems to hover behind the dark plastic face. Controls are kept of the minimum, just two dials which when pushed in scroll through the menus, and when turned, control individual settings. A small remote control takes care of the remaining stereo controls like pause/play, FM tuning and the audio-style presets via an infrared link. 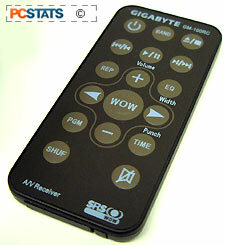 Announced this October at Compute 2003, the Gigabyte M1600A is so new that we don't have any pricing information on it, but after just one look at this amazing little device it will be hard to resist. Small form factor PC's are extremely popular right now, and the M1600A goes a long way towards making a true home theatre PC a reality - both and without the actual PC powered up. Pg 3. How well does it really work?